Today is the day I have to go and see about my tooth. There is this tooth in the back of my mouth that has been giving me problems what with the braces and everything. And my ortho and New Dentist got together and recommended this specialist. His name is Dr. Howard something-or-other and he is in West Seneca. 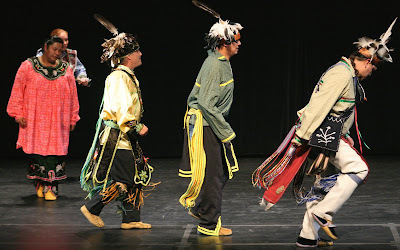 What about the Seneca Nation of Indians? I should have them do a dance of good luck for my tooth! I am not sure I ever told about my adventures with New Dentist. I know I wrote I was getting one. New Dentist is the greatest. We actually met once before at the soup kitchen. I was cooking and he was the volunteer in the office! We sat around the soup kitchen and talked for a couple of hours the way the volunteers at the kitchen sometimes do and then I asked him what he did and he was a dentist. Not only that, but he was Howard's dentist! So now he is mine too. And my first appointment a couple of weeks ago was promising. I did not see one schuft or oik while I was there even though the office is on Sheridan Drive where I know there is many a schuft or oik to be found. And what is especially charming about New Dentist is that his office is not high tech. Here is what happens when they have to send your X-ray to another dentist. New Dentist calls in the hygienist and dictates to her his pronouncements on the situation. Then she disappears. Then New Dentist sits with you and chats. And then the hygienist returns with a neatly handwritten note. He goes over the note and corrects grammar and punctuation. He rethinks phrases. "It would read better if we said it like this," he says. Then the hygienist disappears again. And you chat some more with New Dentist. After 10 minutes or so she returns with the note neatly rewritten. New Dentist checks it over. OK, it's good to go. About a month ago when I began planning to write all those letters to Leonard Pennario's friends and colleagues, I had grandiose ideas that I would hand write the letters. But in practice, forget that! So I admire New Dentist and his priorities and his aesthetics. New Dentist also does not use a computer or anything when it comes to scheduling appointments. On the way out I asked the receptionist if I could take her picture for my Web log and she said yes. So here it is. One question: What is that mallet doing on the desk in front of her? I hope they are not going to use that on my teeth! Certain aspects of 1888, you want them at the dentist's office. Others you do not. Thinking about all this it occurs to me: Thanks to my teeth, my life is much richer. I meet all these people I would not meet otherwise and they are fascinating. I wonder what adventures today will bring. Good luck with the tooth. When a 'bite' changes, it can wreak havoc. 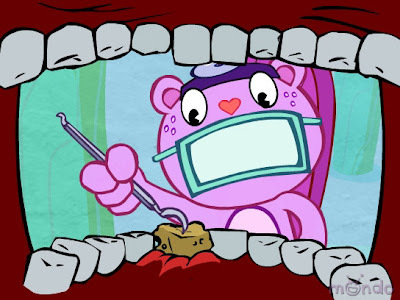 The dentist changed mine once with shoddy work, and it resulted in a bone sliver growing from the gum (root socket)! That was followed by some nice oral surgery! After that, I used to dream about hunting him down with my pliers!